In any novel or short story, the characters move around the world they inhabit: within buildings and throughout neighborhoods, cities, and even sometimes spiritual realms. Let’s talk about how to keep that motion logical. Many of the general concepts discussed last month in “The Style Sheets — Part II: Characters” apply here as well, so you may wish to review that article as we go along. Here We Go Again: Details, Details, Details! Last month I talked about the proclivity of copyeditors to keep alphabetical lists of characters, and how doing so isn’t really all that helpful for maintaining continuity. And so it is with geographical details. Rather than simply listing all places alphabetically, it’s much more useful to group places by their relation to each other: a house with all its descriptive interior and exterior details, shops that are near each other, streets and how they are connected, and so on. One exception I do make to the no-alphabetizing rule is that after the edit is done, I often have a list of minor features such as streets, rivers, or businesses that do not have any extra information associated with them. These I will alphabetize by category—all the streets, all the rivers, and so on—just for ease of finding them. Many novels are set in real locations, and for the most part you’ll need to make sure that the details given reflect reality. Have you ever read a novel set in a location with which you are well familiar and scoffed when a street ran in the wrong direction, or a building was miles away from its real location? (One of my favorite examples from the world of television was from the 1970s sitcom Happy Days; in one episode some characters walked from Milwaukee to Fond du Lac, Wisconsin, in about an hour. Anyone who’s driven from the area where I grew up to Milwaukee knows that it is indeed about an hour from Fond du Lac to Milwaukee — in a car.) When specifics are given, check them out. Get out your atlas or pull up an online map. However, bear in mind also that authors often introduce deliberate fictionalization, much in the same way that phone numbers in movies and on television are often of the “555” variety. So when you find such errors, bring them to the author’s attention, but query whether the error is deliberate. For completely fictional locations, such as fictional towns or fantasy worlds, you may find it helpful to draw maps to help you (and the characters) keep your bearings. This point also relates to the timeline, discussed in next month’s article: if the characters take a day to travel from point A to point B, but a week to return, it’s time to query. Either there’s a problem with the number of days that have passed during that return trip, or there should be a good reason for the delay. Also watch for the relationships between locations; if a hotel is just outside the city limits, how can the bar across the street be 5 miles out? This is where grouping by location can help you catch inconsistencies. Remember that if an apartment is on the fourth (American!) floor, you will climb only three flights of stairs to get to it. Again, as for character details, you can simply copy descriptions from the manuscript to your style sheet to save time, and edit as desired to save space. Note the chapter number where the description first occurs. I Found a Contradiction; Now What? Again, refer back to “The Style Sheets — Part 2: Characters” for guidance on resolving discrepancies. If there is a minor difference, it’s probably safe to change and query. But if the problem involves a factor that’s critical to the plot, bring it to the author’s attention and suggest solutions if you can. Remember that when you are wearing your copyeditor hat, you are like the continuity director for a movie. If the locations are meant to represent real locations, it’s your job to make sure they are accurate. If they are fictional (or fictionalized), make sure they stay true to themselves within that fictional world. Next month, I’ll talk about keeping an accurate timeline to ensure that the story does not breach the space-time continuum (unless it’s supposed to!). This month I continue my discussion of the style sheets I keep and the details that go into them. Let’s talk about tracking character attributes. When I receive a style sheet for a previous book by the same author, whether a standalone title or one in the same series, it usually includes a character list. And by “a character list,” I mean just that: a tidy alphabetical list of character names, often last name first, first name last. We copyeditors love to make alphabetical lists. But for ensuring continuity both in attributes of individual characters and in the relationships between them, such a list isn’t very useful. For example, suppose that in Chapter 1, James is described as being a vegetarian, but in Chapter 18 he orders a Big Mac for lunch. Or suppose that Angela is an only child in Chapter 3, but in Chapter 6 she gets a call from her sister. I don’t know that my memory is good enough to recall a detail from so far back. And often such details are mentioned in the barest passing, and so they are easy to overlook. That’s what the style sheet is for. Any detail that could possibly be contradicted later on goes on the style sheet. Examples follow shortly. In addition, I find it extremely helpful to group characters not alphabetically, but by their relationships to each other. Family members, coworker groups, the neighbors, the guys down at the pub, the bad guys: these are examples of how you might group characters. Sometimes you may not be sure where to put a character. That’s okay; just start them in their own group for now and later it may become clear. The advantage of grouping like this is that it helps you spot name changes (the bartender was Andy, but suddenly he’s become Randy), missing or extra people (there are supposed to be five Murphy brothers, but six are named), and so on. Remember to track nonhuman characters too. I enclose animal names in quotes (“Max” — Susan’s cat; black fur, left front paw and tip of tail are white). Make note of unnamed animals too; make sure that the neighbors’ black lab doesn’t turn into a border collie. In fantasy and science fiction, you may encounter “characters” that are sentient objects such as weapons and other magical items (think of the elven blade “Sting” from Tolkien’s Lord of the Rings), as well as fictional deities, spirits, and so forth. On the style sheet they go. Assuming you are editing in Word, it’s easy to copy relevant descriptive phrases out of the manuscript and plop them into the style sheet, for ease of searching later if you need to refer back to earlier text. I condense the copied text to save a little space by changing spelled-out numbers to digits and editing down to the essential key words (e.g., “her auburn hair cascaded down her back, and fluffy bangs accentuated her ocean-blue eyes” would become “auburn hair down her back, bangs, blue eyes”; “died six days before her eighty-fifth birthday” would become “died 6 days before her 85th birthday”). The idea is to take out information that’s non-essential to the style sheet (you might copy a full paragraph just to grab a few informational phrases). Another point to remember: in hard-copy days, we noted the page number for details, but with electronic editing, page layouts can shift, so use the chapter number instead. You can always use search to find the exact text you’re looking for. Oops. Nancy is blonde in Chapter 4 but brunette in Chapter 27. Michael’s eyes keep changing color from blue to green to blue again. Tonya’s parents died when she was a baby, but also threw her out of the house when she was sixteen. What to do? Remember that it’s the author’s story, so if any major rewriting or plot adjustment is required, it’s up to the author to do so. However, you can certainly help by making suggestions. If it’s a minor detail that’s not critical to the plot, and only a few instances are different (suppose Nancy’s hair is described as blonde twelve times and brown twice), it’s safe to simply change the brown hair back to blonde and write a query alerting the author to the change. If Michael’s eyes are blue six times and green seven times, then you need to write a query that lets the author know about the discrepancy and ask the author to decide which way to go. Let’s say that the fact that Tonya is an orphan is important to the plot, but so is the fact that she had to fend for herself at a young age. That’s not something that a copyeditor can fix. But you might suggest that the author have Tonya raised by an aunt and uncle, and they are the ones who threw her out. You may find a character-related plot hole that has no obvious solution. The best you can do then is outline the problems and ask the author if he or she can see a way to solve them. After that, it’s in the author’s hands — and the author may decide to just live with it. (I’ve seen that happen.) But you’ve done your due diligence. Because fiction is by nature made up, there’s no real-world reference for its internal factual information — so keeping a detailed style sheet with as much information as possible about the characters (and other elements) is enormously helpful for catching inconsistencies. In the next article, I’ll talk about tracking information about locations and buildings, which involves much the same approach as I’ve discussed here. 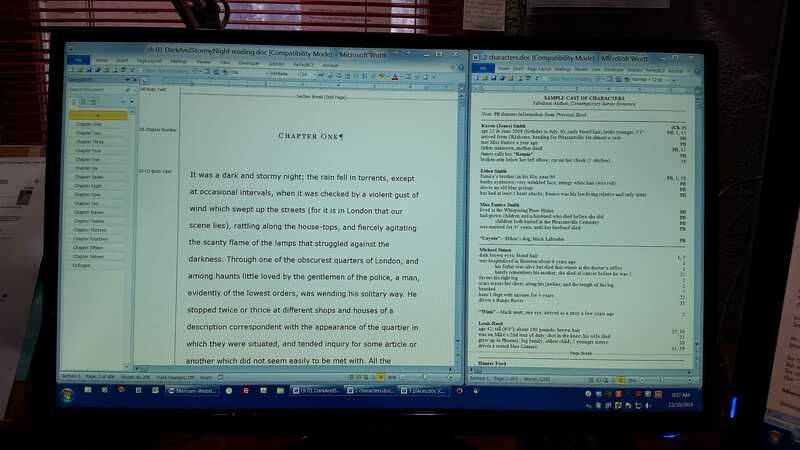 I’d like to digress from the topic of copyediting fiction and expand on something I mentioned briefly last month: multiple monitors and why you should consider adding them to your desktop. This discussion focuses on a PC running Windows 7, because, well, that’s what I have! A few months ago, my 24-inch Flatron LCD monitor suddenly went dead. Black. Gone. 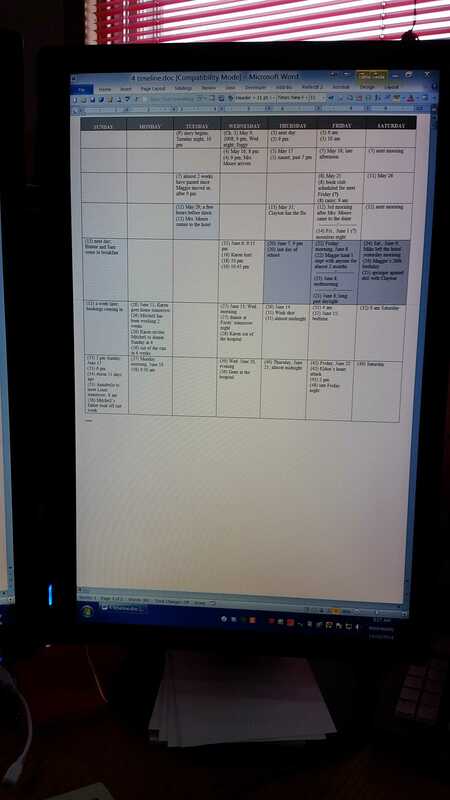 I had a full docket of work, but no matter; I still had three other screens to work with. This is one of the joys of having multiple monitors. I’ve always been like a gas: I expand to occupy all available space. When I started freelancing (working on hard copy), my husband built me a marvelous U-shaped desk system, including a rolling cart for my books and a slanted rack for reference documents, for maximum desktop real estate. But when my workload shifted toward onscreen editing, I began to feel cramped now that the monitor rather than the physical desk was my workspace. And I began to lust after multiple monitors. I lived with a single monitor for years. My last CRT was a monster 21-inch refurb that weighed a ton. My husband had to build a special stand so my desk would support it. Today’s thin, lightweight LCDs are a welcome change. And as the prices drop, it’s easy to afford more than one. My first LCD, a 19-inch ViewSonic, cost nearly $900! But the 27-inch Acer I bought to replace the dead monitor a few months ago was $199 on sale. At first I had just one widescreen monitor while I acquainted myself with HARV. With one monitor, I typically had my manuscript and style sheet open side by side, with browser and e-mail hidden underneath. If I wanted to look something up online or send an e-mail, I’d have to switch to Firefox or Thunderbird and temporarily say good-bye to my Word windows. If I needed to copy something from one window to another, that was more window-flipping. Then came the second widescreen. Huzzah! Now I could view three or four docs at once, without having to switch constantly between them. But a full page was still too small to work with on a widescreen monitor. When onscreen proofreading work started to arrive, I added a third monitor and rotated it to portrait mode so I could view a full page, nice and big. Soon after that, I added the fourth and final monitor, also in portrait mode. Now I can view manuscript and proofs side by side. Luxury! Below is a photo of HARV as he appears today. The leftmost monitor, the 27-inch Acer, is my primary monitor. 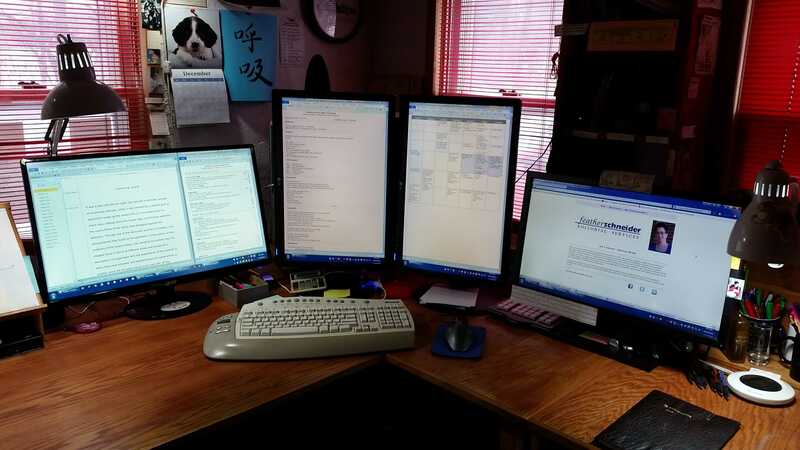 When you set up multiple monitors, Windows will ask you to designate a primary. This is where your Windows taskbar goes, and it’s also where your computer boots before activating the other monitors. In the middle are monitors 2 and 3, both 24-inch LGs rotated into portrait mode. You’ll need to buy a rotating monitor to use portrait mode, of course; Windows enables you to designate a monitor as portrait, which rotates the display 90 degrees. Finally, at far right is the 24-inch Dell. I have dedicated this screen to the Internet: Firefox, Thunderbird, Hootsuite, et cetera. Having it at far right makes it easy to ignore while I’m working, yet I can easily hop over to answer client e-mail or research something. Some people use a laptop with a second, external display, or a laptop as an auxiliary to a desktop, or a tablet as an auxiliary to a laptop or desktop. These are other useful ways to maximize your screen real estate. Last December when HARV’s motherboard died (eep! ), I survived on my laptop and an external monitor while HARV was in the shop. But I felt cramped with “only” two screens, and one of them a laptop at that. The thing I like about having four monitors for one computer is the ability to easily copy and paste text and to rearrange screens to my heart’s content. That’s a little harder to do when your screens are on different machines. And occasionally when I’ve had my laptop running off to the side, I’ve been frustrated by not being able to move my mouse pointer from HARV’s screens to the laptop…until the neurons finally kick in. How Do I Use All That Space? In “The Commandments: Thou Shall Be Efficient”, Rich Adin reports, “Using two monitors increases efficiency by 50%; add a third and gain another 25%; add a fourth and gain another 5%.” So the fourth monitor doesn’t gain me much percentage-wise, but it sure is nice to spread out! It’s very handy to be able to see several documents at once, at a readable size, especially when copying and pasting between them. When I’m copyediting fiction, I keep three documents on the leftmost widescreen monitor (see photo below): the manuscript at left, and my characters and places style sheets atop one another at right. The new big Acer gives me plenty of room to have the Document Map and the styles pane open in the manuscript and still have the style sheets at a readable size. Most of the time when I’m working with the characters and places style sheets, I simply run a quick Find to get to the section I need to see. Having both manuscript and three of my four style sheets visible makes it easy to compare manuscript against the style sheet to check a style point, or to copy text from one to the other. On the leftmost portrait monitor (see photo below) I keep my general style sheet, because it’s nice to have as much of it visible as possible. The rightmost portrait monitor (see photo below) holds my timeline, which is a Word table that simulates a monthly calendar page. It can get long for novels that have a long time frame (especially historical novels that stretch over years or decades). Finally, as mentioned earlier, the rightmost widescreen monitor is reserved for the Internet, so I can easily pop over and check a URL or look something up while keeping my work documents visible. Occasionally I have other documents such as a PDF of a previous book in the series. Usually those go on one of the portrait monitors. (Frankly, if I could have a single portrait monitor for each document, I would.) In my nonfiction work, the portrait monitors are also handy for viewing long tables or design samples and for quickly scrolling through a document a screen at a time, especially if you can zoom it down a little while you do so. As you might imagine, it’s easy to get “lost” among so many monitors and windows. But there are a few tools that can help. The mouse pointer can be hard to locate across several monitors no matter how much you wiggle it around. Fortunately, Windows has a solution. In Control Panel under the Mouse Properties dialog, go to the Pointer Options tab and check the box for “Show location of pointer when I press the CTRL key.” Now, when you press Ctrl, an animated “target” of concentric circles will zoom in on your pointer. Very handy! To move among the manuscript and style sheets efficiently, I use a numbered naming scheme along with the Word shortcut for navigating windows: Alt+W, W, [number]. 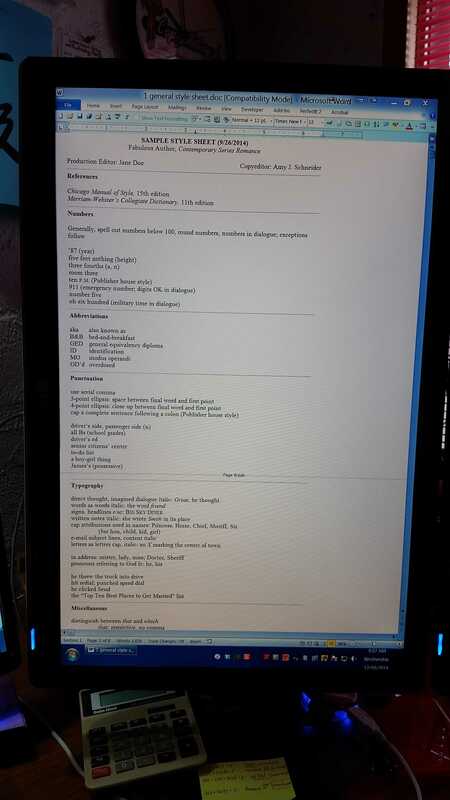 The general style sheet’s file name begins with the number 1; characters, 2; places, 3; and timeline, 4. This forces the files to always appear in the same order in the Switch Windows menu, and also forces the manuscript to appear as number 5. The keyboard shortcut quickly becomes second nature for switching focus without mousing. I’ve read that it takes about two minutes after acquiring a second monitor to wonder why you didn’t get one sooner. I have certainly found that to be true! And If you decide to explore the world of multiple monitors, I hope you, too, find it to be true. Before we delve into the details of copyediting fiction, I’d like to talk a bit about the general approach and mind-set that a copyeditor needs to develop when editing novels, short stories, and the like. Although some elements of the nonfiction editor’s approach remain, some adjustments are required. I’ll start with an anecdote. When I was a greenhorn freelancer in 1995, I pretty much fell into copyediting textbooks, and that soon became my comfort zone. But during that first year, on a lark, I also took a fiction copyediting test (on hard copy!) as part of my application to work for a major New York City publishing house. Sometime later I heard back from the managing editor, who told me that she would like to start sending me novels to copyedit. And (don’t ask me why) I actually argued with her! I told her I didn’t know anything about fiction writing, I had never written anything “creative,” and how could I possibly be qualified to edit someone else’s creation? Bless her, she argued back. She told me that I was exactly what they were looking for — someone who wasn’t a writer and wouldn’t be tempted to put his or her imprint on the author’s work. So I agreed to try. And I’ve been working for her and her colleagues at that same publisher ever since. So with that story in mind, let’s take a look at the fiction copyeditor’s mental toolbox. Tact. Put yourself in the author’s shoes. You’ve opened a vein and labored over your story to get it just right. You’ve presented it to your writer’s group and gotten feedback, and you revised it some more. After that, your agent and the publisher suggested further revisions. Now it’s perfect, right? Time for copyediting. And you just about feel like you’ve been revised to death. Many authors are extremely sensitive to editing at this point, if they weren’t already. So it’s important that you consider your edits and suggestions carefully. Take care that you are making or suggesting a change for a very good reason, and not just for the sake of change or to impose “correctness” where it is not required; in other words, if it ain’t broke, don’t fix it. And if it is broke, cast your queries and comments gently and objectively. Nothing is “wrong”; it is “unclear” or it “doesn’t seem to make sense because [give the reason]” or it “may contradict” something elsewhere in the story. Bring possible problems to the author’s attention, explain why they could create problems for the reader, suggest possible fixes if you can, and let the author decide what to do. Respect. Remember that you are not the author, nor are you a ghostwriter. Your job is to help the author tell his or her story, not yours. I remain in awe of the process of story crafting; it seems like sorcery to me. And that is true for a first-time author or an established New York Times best-selling author. It seems to me that a work of fiction must be so much more personal than, say, a textbook. It takes incredible courage to put one’s creation out for the whole world to see. The story, location, or characters may be taken from the writer’s own life. The theme may be close to the writer’s heart. The writer may be taking a plunge, following a dream. If I can find the author’s website, blog, or Facebook page, I look it over. I look at what other books the author has written. Most important, if I can find a photo of the author, I keep it handy so that I remember the person behind the words. Flexibility. Most book publishers follow Chicago style — but because Chicago is intended mainly for use with nonfiction, in fiction editing it’s more of a guideline (being, after all, a style guide; see, for example, Editors & “Professional” Resources: A Questionable Reliance). Publisher’s house style may overrule Chicago, and so may the author’s chosen style. House style may specify the first spelling in Merriam-Webster’s Collegiate Dictionary, 11th edition, unless the author’s preferred choice is the alternative spelling. The publisher or author may specify correct grammar, spelling, and usage in third-person narrative, but more leeway in dialogue or first-person narrative. (Garner’s Modern American Usage is an excellent tool for understanding variances in usage.) Most difficult of all for the copyeditor with prescriptivist tendencies is knowing when to leave something that is “incorrect” alone. Balancing all of these options can be a tricky business. Spidey-sense. Unlike nonfiction, the “facts” of a fiction work are usually not presented in a linear, logical order. There is no table of contents and no index. Story elements are described throughout; a character’s eye color may be mentioned in chapters 3, 4, 7, 13, 18, and 25. And as mentioned earlier, the story has likely been through many revisions, during which inconsistencies may not have been caught, or perhaps have even been introduced. The author may not have a clear grasp of how a certain process works in the real world, or simply may have been caught up enough in telling the story not to have paid attention to such details. A wise copyeditor questions everything. Was this character present in the scene from four chapters ago that she is now remembering? Can you drive from City A to City B in six hours? To steal an example from film, the director of Driving Miss Daisy did research to determine whether a proper Southern lady would eat fried chicken with her fingers. (The answer was yes.) When in doubt, check it out. Keep meticulous notes (which I’ll cover in future essays). Take nothing for granted. I like to think of the job of copyediting fiction as sanding off the rough edges. The author has done the design and construction; I’m just smoothing and polishing, maybe pounding in a nail that sticks out here or there, maybe applying a little putty where something had to be taken apart and redone. If I’ve done my job correctly, my work is invisible — but it shows off the author’s work to its best advantage.